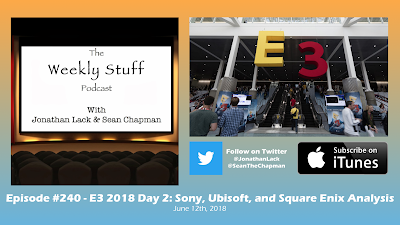 Day 2 of E3 2018 brought us big showcases from Sony and Ubisoft, and a completely baffling non-event from Square Enix, and we recap and analyze all of it on today’s show. We dive deep with the big looks at Assassin’s Creed Odyssey, Beyond Good and Evil 2, Kingdom Hearts 3, The Last of Us Part II, Ghost of Tsushima, Death Stranding,Spider-Man,and much more, celebrate Ubisoft’s awesome dancing panda, reflect on the unconventional structure of Sony’s show, and try to figure out what the hell happened with that bizarre bit of trolling from Square Enix. And we’ll be back tomorrow to do it one more time with Nintendo’s showcase and our final thoughts on the week’s events.